In the past nuts have been avoided because of their high fat content, but the new message from nutritionists is to shift focus from the total amount of fat consumed to the type of fat consumed. This is good news for nut lovers. Though nuts typically derive 80 or 90 percent of their calories from fat, fat found in nuts is largely mono- or polyunsaturated (mainly plant-based, with zero cholesterol). Unsaturated fats are healthier because their molecular links are free to bond with cholesterol and other nutrients, which can then be transported in the blood and absorbed by individual cells. This severely reduces blood flow, resulting in increased risk of heart disease or stroke. Nuts are also helpful in lowering the risk of some forms of cancer. Nutrient-rich, nuts are extremely valuable in a diet that reduces animal fats and proteins; emphasizes fruits, vegetables and fibre; and helps in maintaining healthful weight. For people who cannot or don't want to include dairy products in their diets, nuts can also be used to make a sweet milk alternative. By blending 1/3 cup of finely ground nuts to 3 cups of water, 1 teaspoon of lecithin granules and 2 tablespoons of honey you can make a tasty nut 'milk' which is very nutritional. 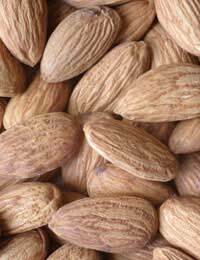 Almonds (100g serving) contain 18.7g protein, 51g fat (primarily unsaturated), the highest source of calcium of all nuts with 260mg, 5.25mg iron, 215mg potassium, 296mg magnesium, 17mg sodium as well as traces of vitamin B1, B2 and 3.5mg niacin. Brazil Nuts (100g serving) contain 66g fats (primarily unsaturated), 14g protein, 190mg calcium, 225mg magnesium, as well as being a good source of selenium. Chestnuts (100g serving) contain 62-70g of sugar andamylum, 5.1-10.7mg of protein, 2-7.4mg of fat, vitamins A, B1, B2 and C and inorganic salt. Hazelnuts (100g serving) contain 62g fat (primarily unsaturated), 13g protein and are the second highest source of calcium of all the nuts, with 200mg. Macadamia Nuts (100g serving) contain 9.2g protein, 76.4g fat (primarily unsaturated), 10g sugars, 1.4g dietary fibre, 53mg calcium, 241mg phosphorus, 409mg potassium and 4mg sodium. Peanuts (100g serving) contain 24.3g protein, 2mg iron and 3mg iron, while 100g of almonds contain 16.9g protein, 4.2mg iron, 250mg calcium, 20mg vitamin E, 3.1mg zinc and 0.92mg vitamin B2. Pecans (100g serving) contain 65g fat (primarily unsaturated); though they contain only 7 grams of protein they are high in vitamin E with 100g consisting of about 45%. Pine Nuts (100g serving) contain 16.7g of protein, 63.5g of fat (primarily unsaturated), 9.8g of carbohydrates, 236mg of phosphorus, 78mg of calcium and 6.7mg of iron. Pistachio Nuts (100g serving) contain 19g protein, 43-63g fat (primarily unsaturated), 30mg ascorbic acid (most nuts have hardly any), 131mg calcium, as well as traces of magnesium and vitamin A.
Walnuts (100g serving) Contain: 15-20g of protein, 60-70g of fat (mainly unsaturated with a high content of linoleic acid), 10g of carbohydrate, inorganic salts and microelements such as calcium, phosphor, iron, manganese and zinc.